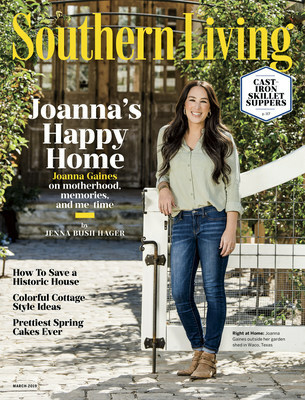 NEW YORK, Feb. 12, 2019 /PRNewswire/ -- Joanna Gaines reflects on motherhood, family traditions, memories of a happy home, and the importance of self-care, in the March issue of Southern Living, available on sale February 22. With a children's book out this month and plans for a television network, the Fixer Upper star from Waco, Texas, has not shown any signs of slowing down. In her most important and cherished role yet as a mother of five to Drake, 13, Ella Rose, 11, Duke, 10, Emmie Kay, 8, and Crew, 8 months, she considers raising her family a top priority and values their precious time together. To access the full story, click here. Editor-at-Large for Southern Living, NBC News correspondent and, most importantly, mother of two, Jenna Bush Hager sits down with Joanna in Southern Living's new column "Mom to Mom" to chat work life, home life, and how to get it all done. Jenna talks new career adventures, old family recipes, hometown memories and pearls of wisdom that are passed down from generations, celebrating the milestones and the imperfections. Family is the cornerstone of life for Joanna. "You look back, and you realize it's true what people say about kids growing up so fast. … The kids are what keep us grounded," she says. "Time together as a family is a gift," Joanna says. With lessons from her own childhood and mother, Nan, she has a clear vision to find energy and carve out her schedule for family. "The biggest investment that I'll ever put into life as a woman or as a wife or as a mother is time. That is my greatest investment." In her new children's book, We Are the Gardeners, Joanna uses gardening as a metaphor for parenting. "You can find healing and learning and so many other gifts in having a garden," she adds. "Nurturing plants together does something, and it was a simple way to connect with my kids." Her fondest memory of her teenage years in Texas is the sense of security. "That was my safe place—and I loved it." She credits her parents for playing music in the house, which now brings her back to the '80s. "When I hear a song, I can remember where I was—to the exact moment. … It just makes me feel at home every time I hear it." Nowadays, Joanna reflects on how she can encourage other moms. "Know that you are doing enough," Joanna says. "Comparison is the worst thing in the world. Contentment is the goal and the greatest gift in life."